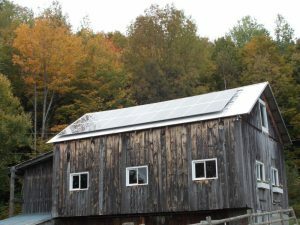 It’s been a year now since Bristol Electronics installed those 20 beautiful solar panels on our barn roof. We could not be more pleased with the entire experience – from initially contacting you for a consult and estimate, to the easy and timely installation, to the performance of the panels, and to how they have changed the way we view the production and consumption of electricity. Without sounding too melodramatic about it, we are consistently impressed and amazed each sunny day to see how much electricity they produce – it’s a wonderful confluence of solar physics and human ingenuity. We love watching that electric meter spin backwards. Over the course of the first year the output from our panels was over 95% of the estimated amount, and that was in spite of a cloudy, snowy winter. Yet, we accumulated enough credit with GMP that we took the next step and replaced our propane hot water heater with a super-efficient electric one. I never thought we would go back to an electric water heater. Since our first involvement with Bristol Electronics eight years ago when we had our satellite TV service installed to now, we have love dealing with your company, whether it’s for a service call or something as sophisticated as the solar panel installation. Making a call to Bristol Electronics is like phoning a friend: someone always picks up the phone promptly, and responses are timely, friendly, and helpful. Your employees are all fi rst-rate and provide high-quality, friendly service. Thank you for being our friend and neighbor.